PRELIMINARY LISTING! New photography forthcoming. 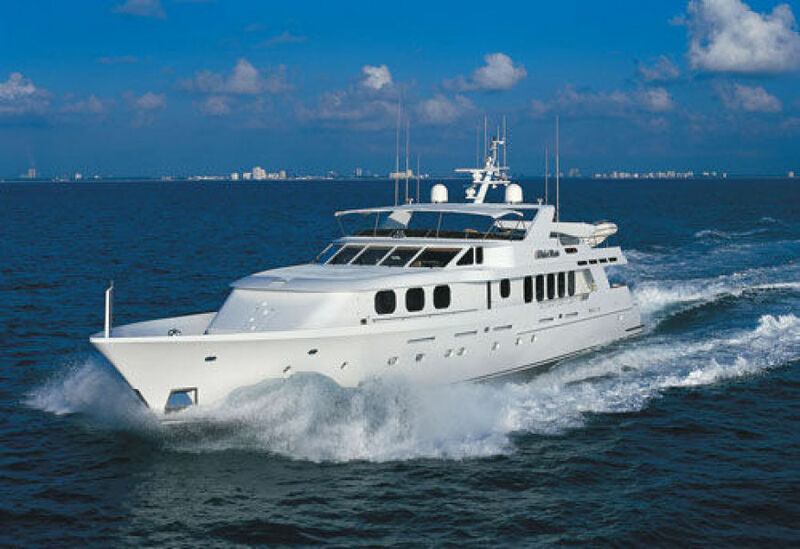 CACHEE represents a highly customized and classic 124' Christensen Motoryacht built and maintained to ABS classification featuring full walk-around teak decks. 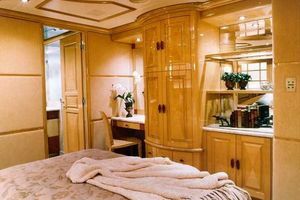 Accommodations include a (5) stateroom layout with on-deck master stateroom with His & Her bath along with (4) guest staterooms below, all with ensuite baths. This vessel received a major refit in 2014 and has had numerous upgrades since including a complete paint job and hard top installation in 2016. Powered by DDC/MTU 16V-2000's, CACHEE cruises comfortably at 14 knots with top end speed of 18 knots. Her 8000 gallon fuel capacity provides for extended range. 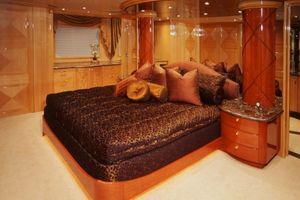 Flybridge amenities include oversized 6-person Jacuzzi tub, full wet bar, sunlounges and dining areas. 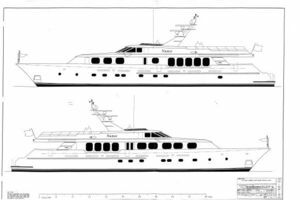 Additional large yacht options to include Naiad stabilizers, twin Northern Light 65KW Gens, bow thruster & (2) 1500 GPD watermakers. Bridge deck toys include a 22' Novurania tender and (2) new Yamaha waverunners serviced by a 4000lb crane. 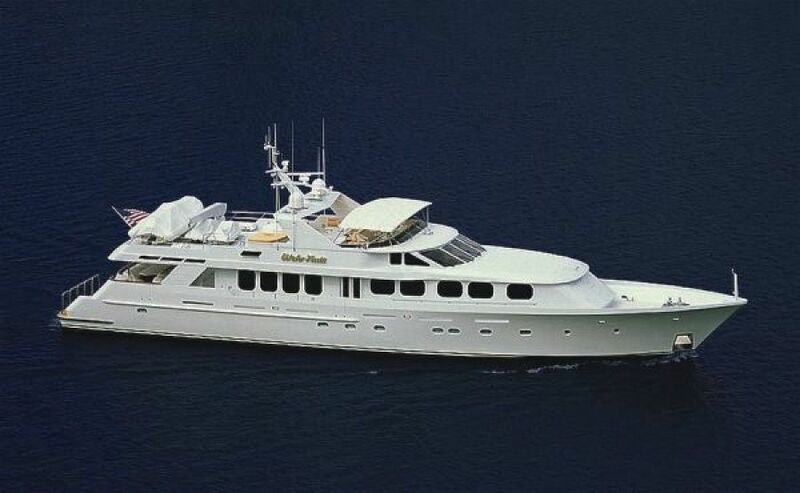 United Yacht Sales New Jersey would love to guide you through a personal showing of this 124' Christensen Raised Pilothouse My 1999. 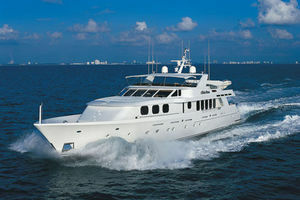 This yacht for sale is located in Fort Lauderdale, Florida and priced at $6,995,000. For a showing please contact us by filling out the form on this page and we will get back to you shortly! CACHEE represents a highly customized 124' Christensen upgraded and maintained constantly by a very knowledge owner and crew. Complete paint job and hard top installation in 2016 along with all new interior soft goods and upgraded systems. 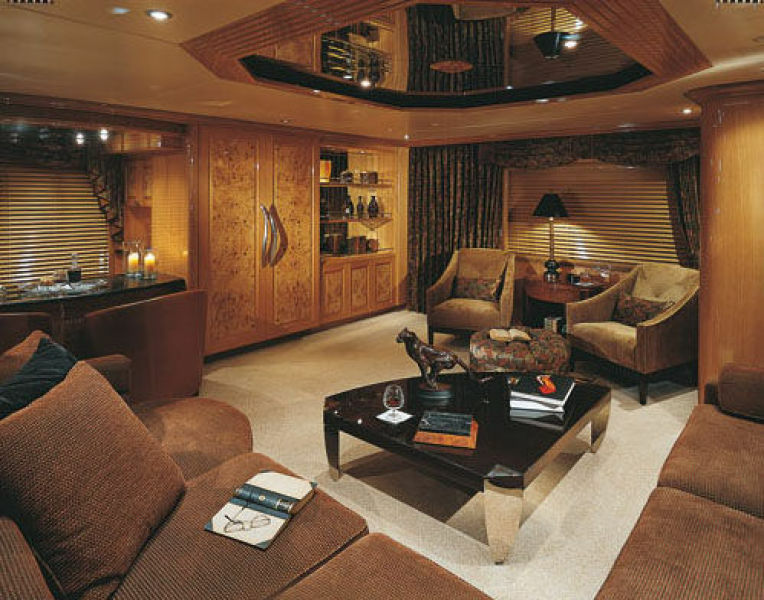 This unique vessel features a custom interior with abundant use of high gloss Anigre joinery and with Mappa Burl raised panels and crown moldings throughout. 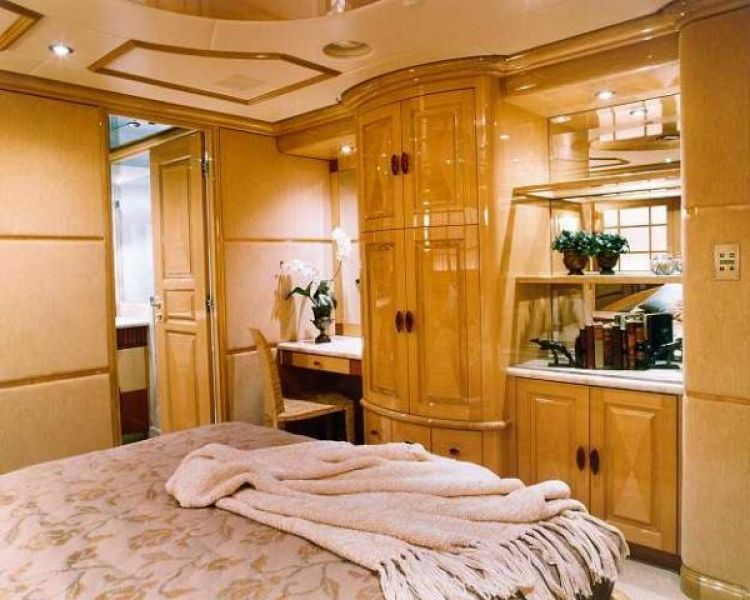 Her layout includes an on-deck master stateroom forward. 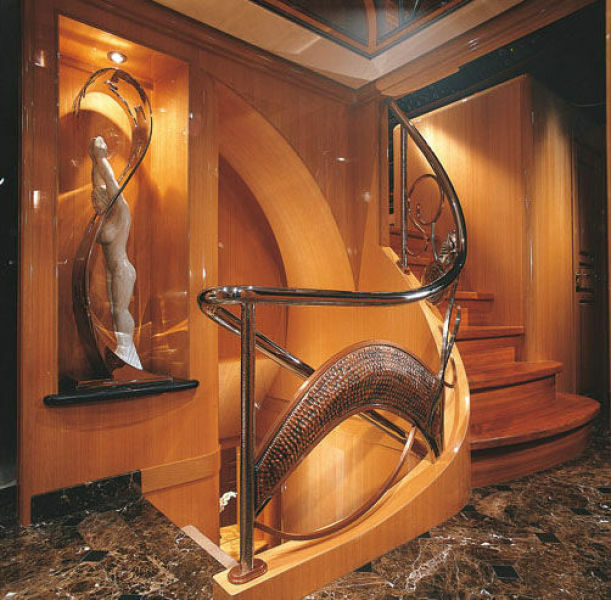 The starboard foyer is the center of circulation where there are custom features including a cathedral like recess above the stairs, stylish custom handrail by Elp Designs incorporating stainless and copper along with foyer art niche and Emperador marble flooring. A casually elegant interior is achieved with all new custom fabrics in warm tones throughout. Exquisite interior doors and cabinets with raised panels utilize the inherent grain of quarter sewn Anigre as a design pattern that repeats throughout. The salon's entertainment center is located aft and equipped with all the state-of-the-art A/V system. 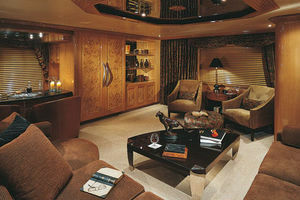 Opposite is a custom L-shaped upholstered settee along with a sunken bar forward. The forward dining area features a dining table with pedestal base and seating for eight. 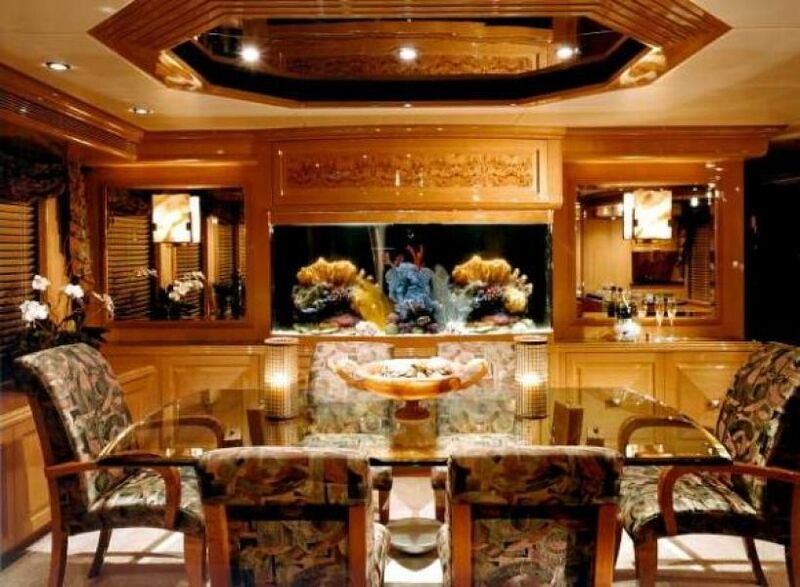 On the forward bulkhead wall is a custom 6' long saltwater aquarium visible from the salon through the yacht's elegant dining room. High-gloss Anigre provides a perfect backdrop for the colorful tank. 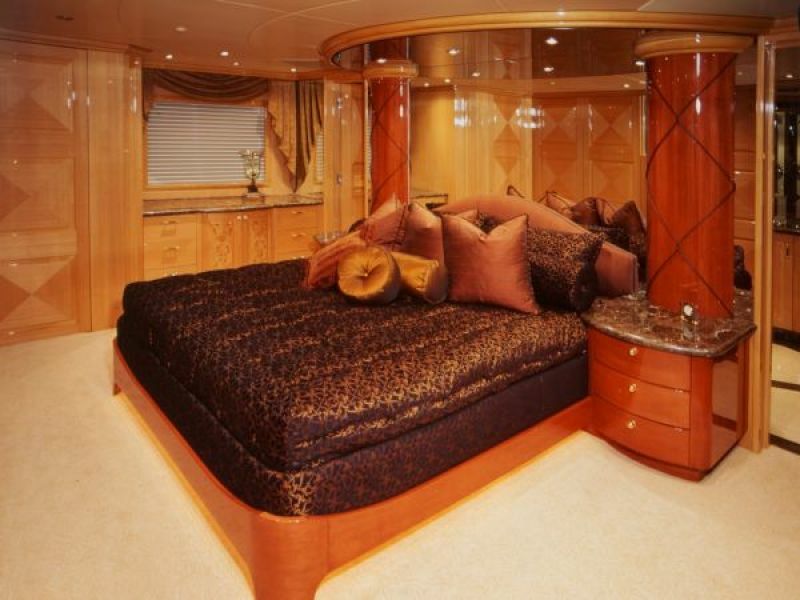 The on-deck master stateroom features a California King bed, hidden bar behind the cabinetry at the foot of the bed. At the head of the bed is a large smoked mirror framed by two cherry-stained anigre columns above the bedside nightstands. 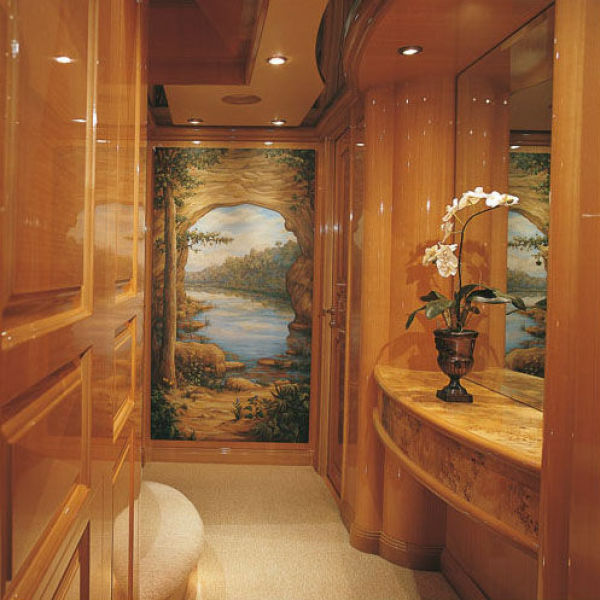 Forward is a full-width His and Her bath with marble shower and Jacuzzi tub. 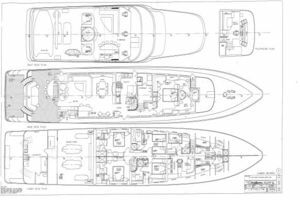 Below deck there four guest staterooms to include two VIP Queen staterooms aft to port and starboard. 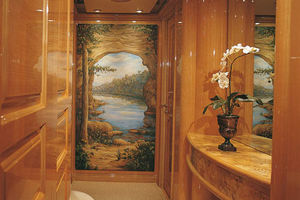 Forward, is an additional Queen stateroom and to starboard is the twin stateroom to port. 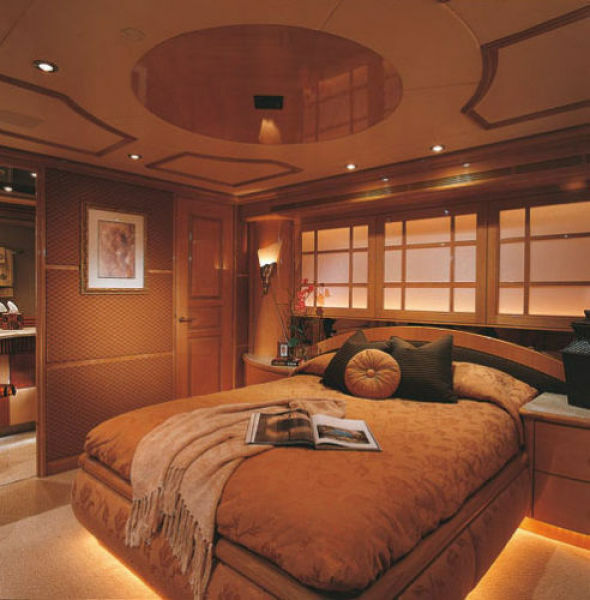 All staterooms feature their own private bath, Sohji screens with accent lighting, warm fabrics and entertainment centers. The oversized aft deck features seating for ten in a radius bench seat with a custom AJ Originals teak table with a compass rose inlay design. There is a sunken bar with sink and icemaker along with four Timeless bar stools. You can access the vessel by boarding gates port and starboard and two wing doors. 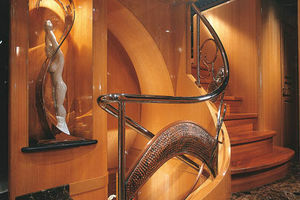 Stairwell to starboard accesses flybridge. 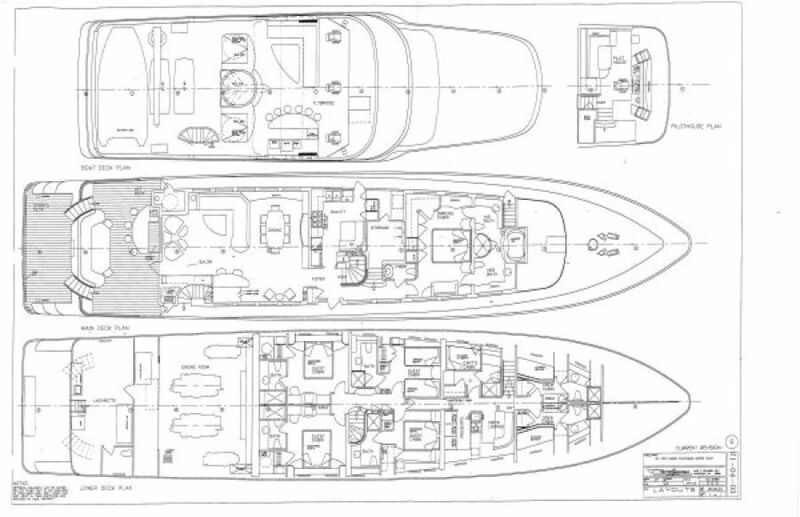 There are dual stairs down to sport deck with oversized dual windlass and oversized bits for towing. 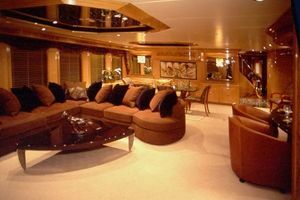 On the sport deck, there is hot/cold shower and access to lazarette and engine room. 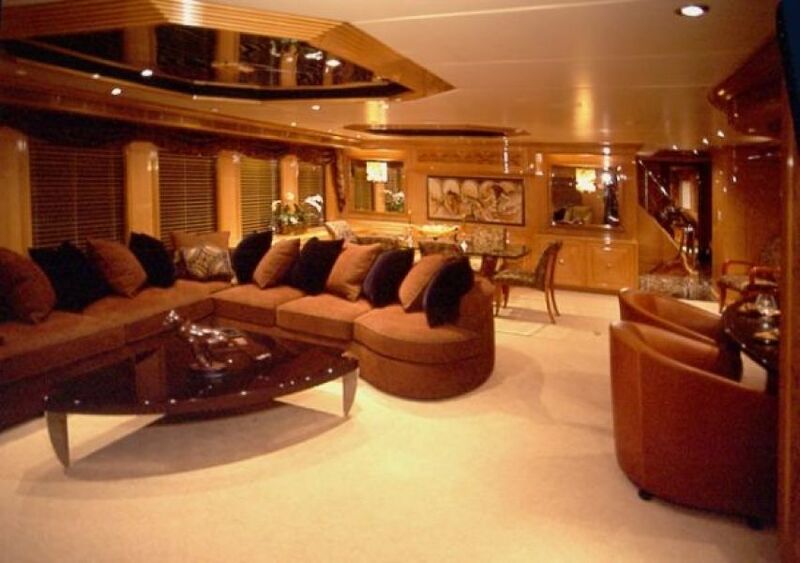 The spacious flybridge features an L-shaped upholstered settee, cocktail tables, sunpads, 6-person Jacuzzi and teak decks. 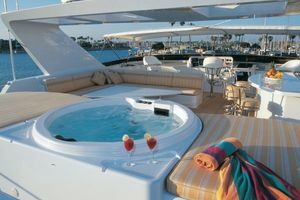 To starboard is the full bar equipped with a TEC infrared grill, icemaker, refrigerator, sink and Timeless bar stools. The center helm station has three helm seats along with two wing stations allowing for great visibility. 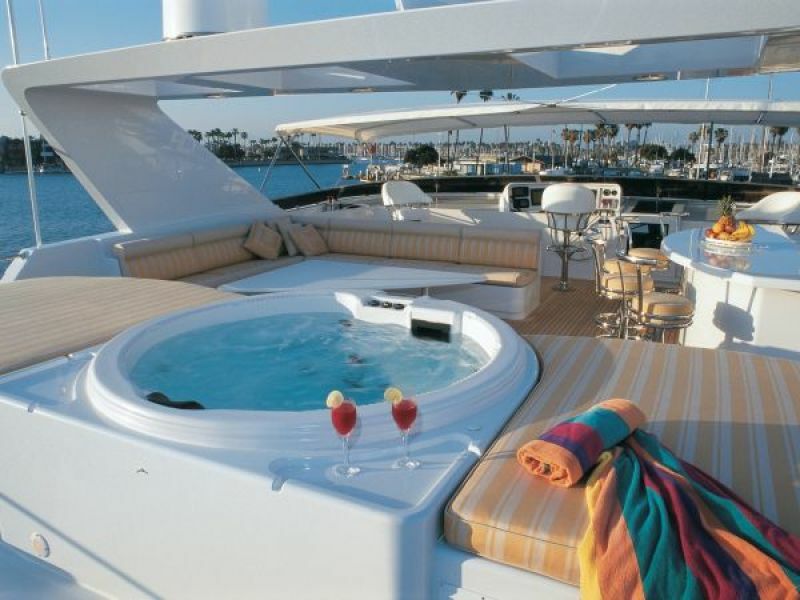 Several customized features include marine misters integrated into the lighting, storage space for two props under sunpads on either side of the Jacuzzi and a radar arch with large opening cut out of the top to let in sunlight. Stored on the boat deck aft is a 20' Novurania tendem two Yamaha waverunners and 4800lb davit. The chocks are removable to provide space for larger parties. While all the systems, piping and structural details meet stringent ABS Maltese Cross AMS rating, the entire vessels was engineered to float against the outer glass shell on elaborately laid-out layers of cork-filled plywood, Airex, lead sheeting, foam and carpeting to reduce engine noise and vibration to the barest minimum. To reduce noise further, the bulkheads around the engine room received even thicker layers of foam and plywood and all major engine room equipment is soft-mounted on rubber supports. 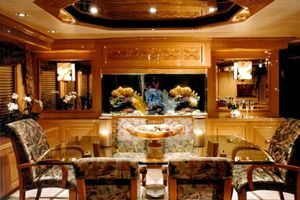 The result is an exceeding quiet yacht, the noise level in the salon at cruising speed is a mere 62 decibels, while the guest stateroom, just forward of the engine room - is only one decibel higher. 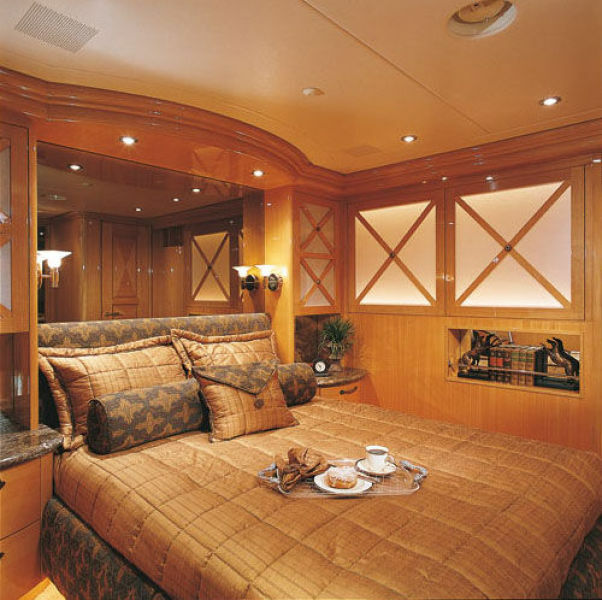 The master stateroom is even quieter, just 50 decibels. 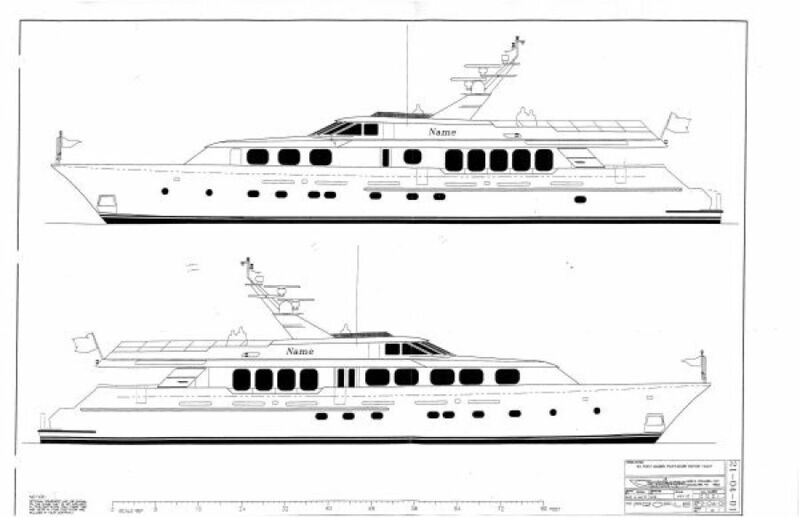 All mechanical equipment throughout the yacht is duplicated, reducing the need for a large spare part inventory. All pumps, for example are redundant including the battery chargers and air conditioning systems. The vessel's systems are easily accessible to include the air conditioning air handlers placed in the side deck overheads. The air conditioned lazarette houses the main ship's electrical panel that slides out on rails for full access. 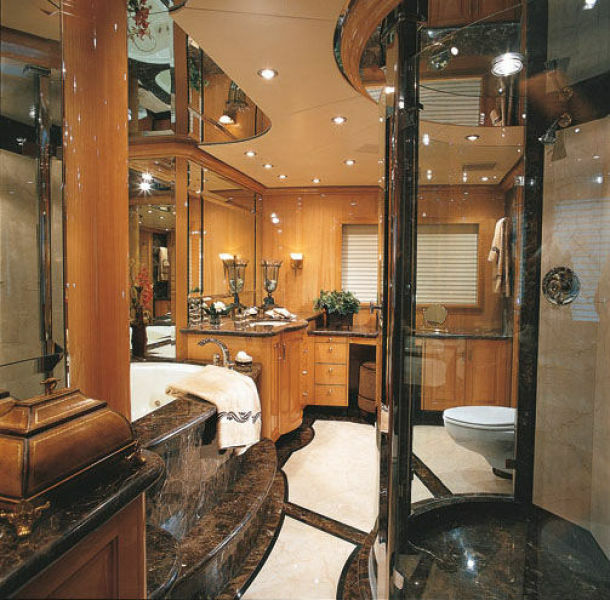 A head and shower also allow for ample workspace for engineering without interfering with the rest of the yacht's operations.